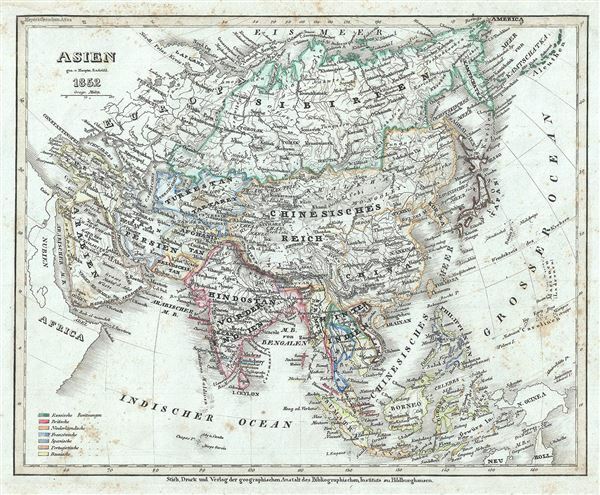 This is a fine example of Joseph Meyer's 1852 map of Asia. It covers the entire continent from the Mediterranean Sea to the North Pacific Ocean, including the Aleutian Islands. The map covers Turkey, Arabia, Persia, the Indian subcontinent, Siberia, the Chinese Empire, Japan and Southeast Asia. It further includes Mongolia, Tibet and Korea within the borders of the Chinese Empire. Taiwan or Formosa is mapped vaguely, representing the poor knowledge of the region prior to the Japanese invasion and subsequent survey work of 1895. The sea between Japan and Korea, whose name, either the 'Sea of Korea' or the 'Sea of Japan,' is currently a matter of historical and political dispute between the two countries, is here identified in favor of Japan. Singapore is also identified. As this map was drawn, Imperial China wilted under the weak Qing while the Russian attained the height of its pan-continental expansion. Turkey and much of the Middle East was under Ottoman hegemony. In India, shortly after this map was made, in 1857, the sepoys of the British East Indian Company would revolt in India's First War of Independence, which would lead to the collapse of the British east India Company and the consolidation of India under the suzerainty of the British Raj. Very good. Minor overall spotting and toning.